Get ready to roll your way to winnings with 100 Free Spins on RealTime Gaming's Asian inspired video slot machine, Lucky Tiger. With 5 reels and 88 pay lines, Lucky Tiger is another example of the high quality work that RealTime Gaming puts into their online casino game releases. 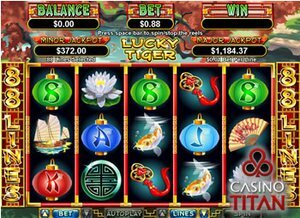 Coloured Chinese lanterns with card faces from 9 through A accompany coi fish, paper fans, junk boats, pagoda scenes, and golden tigers in this top slot machine. Features include a bonus mode, Scatter and Wild symbols in order to increase chances of hitting it rich. To give players even more reason to try out this great game, RealTime Gaming operators are giving away 100 Free Spins to players who create a new account with their sites. In order to unlock this huge extra, users need to deposit more than $20 and use the bonus code 100LUCKYSPINS, and get to playing. The betting range is kind to both timid and aggressive users with $0.01 to $1 per line, meaning that each spin can be worth anywhere between a penny and $88. Withdrawal of the winnings from these requires a 10X playthrough which amounts to $200 worth of play with the minimum deposit requirement. After that requirement is met, there is no maximum cash out. This offer is valid through March 31st, 2015 so while there is still time to get in on this great deal, don't delay and run the risk of your luck running out! You'll need every roll to count as the randomly awarded jackpot in this game which amounts to 5888 credits per line bet. To try your hand at Lucky Tiger and get rolling with 100 free spins, head over to Casino Titan where you can also take advantage of our exclusive no deposit offer of $25 using 25NODEPOSIT as the bonus code! This site has a great reputation among players and regularly offers competitive deposit matching bonuses and weekly promo codes sent directly to your email.